We have now applied paint to the porch itself. 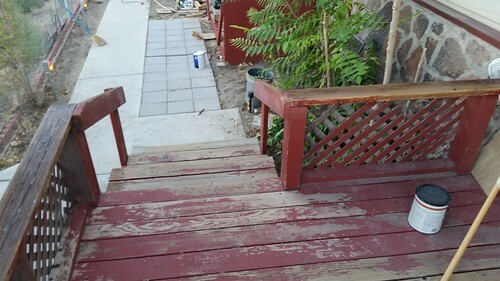 After scrubbing the wood down with a wire brush, sandpaper, and then sweeping and blowing debris away, Lisa applied sanding sealer as an undercoat on the porch rails. 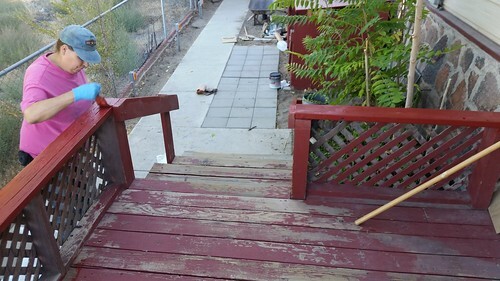 Yesterday evening, Lisa applied paint to those rails. It's mainly the upward-facing surfaces that get direct sunlight that needed paint. Anything that doesn't get hammered by the sun doesn't decay so badly. I mentioned yesterday that we need to keep the front door free, and that this complicates painting the porch in front of that door. That's not because it's the only door in the house, but because the other ground-floor door is in a mechanical state that means that we're concerned that every time we open it may be the time it won't close again. One of our long-deferred projects is to replace the sliding-glass door (which is subject to jamming due to the ever-present find dust here) with "regular" doors. This is a project that needs a contractor, and we just haven't gotten around to it.